Perovskite-based solar cells are fast forwarding to the front of emerging photovoltaics, already competing on efficiency against well-established solar technologies used in solar panels around the world. An important step towards mass production of this new generation solar cells is the development of efficient selective contact layers that would be compatible with the deposition of perovskite layers on various substrates. 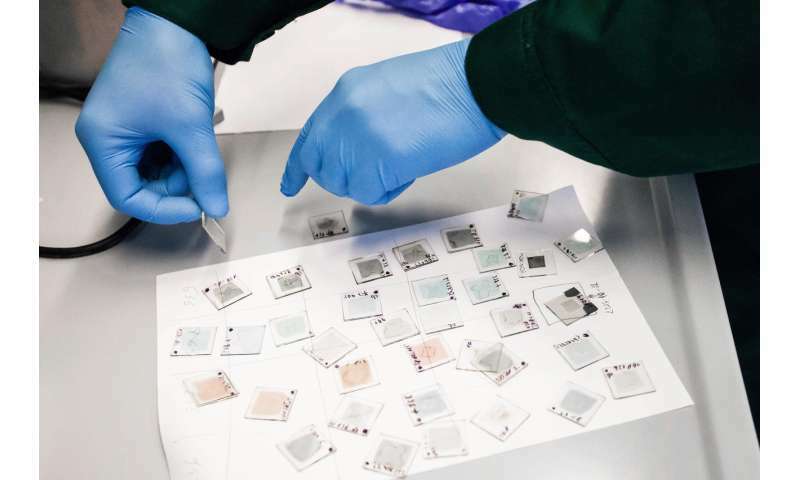 Spin-coating and vapour deposition are the two main methods which are currently being used for the formation of the layers in perovskite solar cells. Spin-coating involves dripping liquid solution on spinning surfaces; during the process large quantities of the material is being lost. Vapour deposition needs high temperatures and complex vacuum technologies, besides, not all the molecules are suitable for evaporating. KTU chemists have synthesised a molecule assembling itself into a monolayer, which can evenly cover any oxide surface – including textured surfaces of the silicon solar cells used in tandem architectures. “It’s not polymer, but smaller molecules, and the monolayer formed from them is very thin. This, and the fact that the monolayer is being formed through dipping the surface into the solution makes this method much cheaper than the existing alternatives. Also, the synthesis of our compound is a much shorter process than that of the polymer usually used in production of perovskite solar cells”, says Ernestas Kasparavičius, PhD student at KTU Faculty of Chemical Technology. The synthesised material had to be tested. The team of physicists of HZB in Berlin, Germany headed by Dr Steve Albrecht, in collaboration with KTU doctoral student Artiom Magomedov successfully used this new material as a hole transporting layer in perovskite solar cells. “In our laboratory in Kaunas we studied use of the self-organising molecules to form the electrode layer as thin as 1-2 nm, evenly covering all the surface. 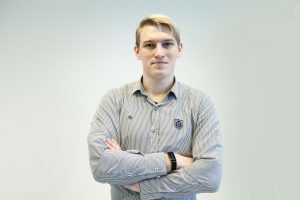 During my internship in Berlin I was able to apply our material and to produce a first functioning solar element with just a monolayer-thick selective contact”, says Magomedov, young researcher at KTU Faculty of Chemical Technology. 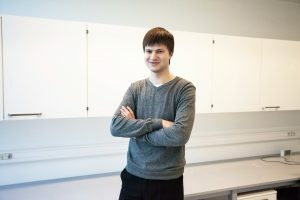 Professor Vytautas Getautis, who is the head of the research group behind the invention and the PhD research supervisor of Magomedov emphasises the input of the young scientists: “Usually it is so that the seasoned researchers are generating ideas and the youngsters are implementing them. However, in this case the young researchers have both generated the idea and realised it in solar element production”. Using self-assembling monolayer technique, not only extremely low material consumption is achieved, but also high efficiency – the element’s power conversion efficiency was close to 18 %, which is exceptionally high for a new technology. Also, when self-assembling monolayer is used as a hole transporting layer in perovskite cells, no additives are needed to improve the performance of the cells. This might significantly improve the life span of the elements. Following initial success, scientists at KTU are synthesizing new materials for monolayer formation. Already the first tests of the optimized materials at HZB led to the over 21% efficient solar cells. The cooperation of Lithuanian chemists and German physicists resulted in the publication “Self‐Assembled Hole Transporting Monolayer for Highly Efficient Perovskite Solar Cells”, published in Advanced Energy Materials in November 2018. Since this approach to perovskite solar cells has never been considered before and can potentially play a role in industrial processes, the HZB and KTU teams have filed a patent application on the molecule and its use. More information: Artiom Magomedov et al, Hole Transporting Monolayers: Self-Assembled Hole Transporting Monolayer for Highly Efficient Perovskite Solar Cells (Adv. Energy Mater. 32/2018), Advanced Energy Materials (2018).